Lee Molyneux in action for Morecambe at Hartlepool. Morecambe winger Lee Molyneux knows all about playing for, and beating, Accrington Stanley. The Shrimps will look for a first Football League win over their Lancashire rivals at the 17th attempt at the Globe Arena on Saturday. Molyneux, who has scored for Stanley against Jim Bentley’s side in the past, is the latest player to turn out for both clubs and is intent on setting the record straight. The 26-year-old summer signing said: “I know all about the record and it’s something we’d like to put right. “I’ve come across Accrington before since I left. “I played against them in the Johnstone’s Paint Trophy for Crewe and I played against them on my home debut for Tranmere last year which we won 3-0. The Red Rose derby might not be a game that attracts much attention outside of the two clubs but Molyneux is well aware of what a big occasion it is for both sets of fans. The former Everton youngster said: “It’s the only local derby for us both. “This is a big game for the two clubs and the one the fans will look out for when the fixtures come out. “It’s always nice to play in these games. “There’s going to be a good atmosphere from both the home and away fans. The wide man should have been joined by another former Accrington man in The Shrimps side but new captain Peter Murphy is set to miss three months after damaging medial knee ligaments. Molyneux said: “He’s massive for us. “Since he came in he’s got the full respect of the lads and that’s one of the reasons he got the captaincy. “He knows this league, did well at Wycombe last year and is a very likeable lad. “He does a very good job in there for us and has been a great signing. 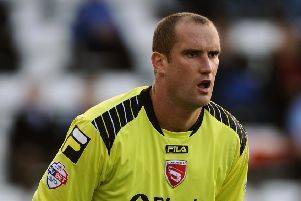 Molyneux has caught the eye in Morecambe’s opening two games. The Shrimps have slipped to defeats against Hartlepool and Sheffield United but the left-footer has seen plenty of promise. “It’s encouraging though. It’s not like we’re being outplayed and not creating stuff. “We are creating stuff and I think once that comes together then the goals will start coming. “We are looking forward to putting a performance in and hopefully getting the result this time.